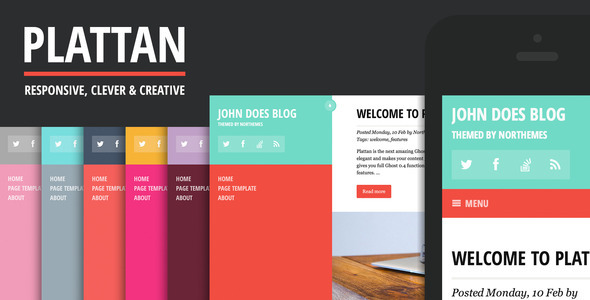 Plattan – a fresh and clean responsive WordPress-theme from Northemes. It’s flat, simple and elegant and makes your content get all the attention it deserves. You get 6 color schemes with this theme. If you want you can add a color scheme picker to the theme, so your visitors can choose their own style. Or you just link the scheme you want to show, see the docs. To add more variety to your blog, you can choose 3 additional post formats. One for status updates, one for quotes and one for links. Of course you can even make sticky posts. See the docs and the preview.